LoveToKnow welcomes jewelry artist Corey Ackelmire for a hand crafted metal art jewelry interview. Corey creates art jewelry that is modern and feminine and inspired by her metalwork hollowware and sculptures. Corey Ackelmire is a jewelry artist, sculptor, and instructor based in Houston, Texas. She received her Bachelor of Fine Arts in Metals and Jewelry from Missouri State University in 2003 and her Master of Fine Arts in Jewelry, Metals, and Enameling from Kent State University in 2007. Her jewelry designs include pendants, earrings, rings, and barrettes. Ackelmire is currently a full-time Jewelry and Metals instructor at Houston Community College. Corey Ackelmire creates jewelry that she hopes will be both enjoyable and thought provoking to the wearer. LoveToKnow (LTK): You are a metalsmith, sculptor, and teacher. Do the same things inspire your work in each of these areas? Corey Ackelmire (Ackelmire): More or less, yes. Essentially what inspires me in all these areas is the drive to understand why and how we (as in people) do the things we do. Why do we make what we make, care about what we care about, and how do we learn? LTK: What inspires you to create a piece of jewelry? Ackelmire: My jewelry is usually inspired by decorative elements from my metal hollowware but also from traditional decorative arts, especially embroidery and fabric crafts. 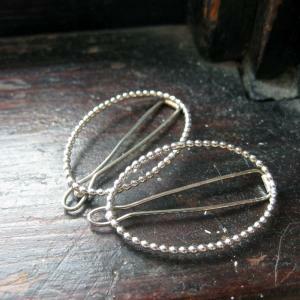 I enjoy the delicate and feminine qualities of that work and try to make jewelry that has a similarly delicate quality. LTK: In your artist statement, you ask the question, "Should the craft be about the good design of useful things, or should it ask questions about the meaning of those things?" Your statement describes how your "work seeks to exist at the intersection of this debate." Could you give some examples of your work based on this concept and how it reflects this idea? 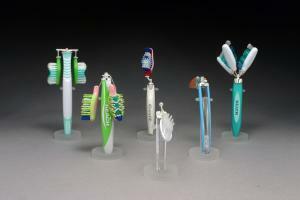 Ackelmire: My toothbrush sculptures are some of my favorite examples of this idea. Each sculpture combines at least two mass-produced toothbrushes (which are elaborately designed) with my hand-crafted metal mechanisms. By fabricating mechanisms that are simple, straight-forward, and obviously made by hand and juxtaposing them with the commercially produced brushes, the viewers attention is drawn to complicated visual designs of the brushes, which most people generally take for granted. People usually say they will never look at toothbrushes the same way again, and that is a good response in my book. LTK: What do you hope people will see in your jewelry? 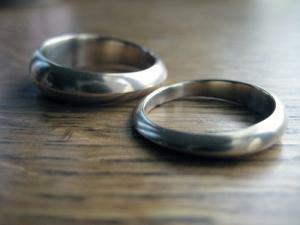 What do you hope the wearer will feel when wearing your jewelry? Ackelmire: I hope people see my jewelry as feminine and fresh. I hope they'll feel both those things when wearing it. 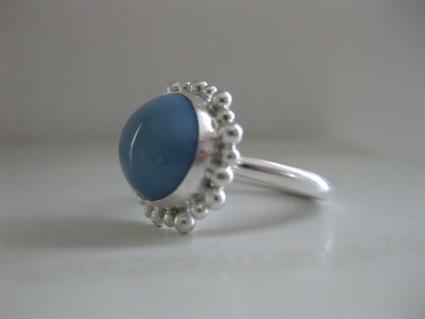 LTK: You work primarily in sterling silver for jewelry designs. Why do you prefer this metal? What other materials do you work with? Ackelmire: Silver is an attractive, easy-to-work-with metal. I personally like to wear it, because I like the color and the patina it develops with wear. I work with all other non-ferrous metals (gold, copper, brass, nickel silver, etc.) and plastics (in my sculptural work). I occasionally work with glass enamel, but prefer to make jewelry from primarily metal because it is more durable. LTK: What type of metalwork techniques do you generally use in your jewelry design? Ackelmire: For my jewelry, I enjoy using die-forming (pressing sheets of metal into plexi-glass cut-out dies) to create dimension. I try to keep the techniques in my jewelry simple so that I can make it efficiently. Recently, I learned more techniques for setting faceted stones, and I hope to incorporate more of that in my future jewelry. LTK: What was the most memorable or meaningful piece of jewelry that you created? Ackelmire: I cast gold wedding bands for my best friend's wedding 3 years ago. LTK: Do you enjoy creating a particular type of jewelry? If so, what type and why do you like it? Ackelmire: I have always preferred making rings because rings are very sculptural and, as the wearer, you can always see them. They are the jewelry that you wear for yourself (unlike earrings, which only other people can see). LTK: Do you have any advice for aspiring jewelry artists who would like to get a BFA and MFA in jewelry and metals? Ackelmire: My advice is based entirely on my own experience, which I felt was a positive one, but that doesn't mean it's the route everyone should take. For the BFA, go to a Liberal Arts school where you will have to take courses in disciplines outside of art; you need to have something to make art about. For the MFA, talk to and visit the programs you are thinking about. Visiting the school and talking to the current grads and the faculty can really change your idea about what school is right for you. I applied to five graduate programs and visited four of them. My top school going into the visits was different when I came out. To learn more about Corey Ackelmire and her jewelry visit her official website and blog. Customers can purchase her handcrafted metal art jewelry at her Etsy shop.